Joyoldelf Rosewood Tobacco Smoking Pipe is the symbol of elegant life, not only remain traditional culture, but also being safer and more environmental friendly. The attached scraper can reduce the dust and soot in the pipe effectively, keep heath and free of harmful objects. Joyoldelf provides 100% high quality guarantee and new quality commitment. Classic arabesquitic, looks beautiful and elegant. Detachable and free disassembly pipe, it is easier to clean. Safe and very durable, you can use it for a long time. Environment friendly and do not waste. Please make sure the pipe cool completely before cleaning. Never clean while it is warm as it may cause cracks. Please be careless when using, in case any damage to pipe, especially for cleaning. ROSEWOOD TOBACCO PIPE: Made of high quality of rosewood and food grade ABS material (not contain harmful objects), so you don't need to worry any harm for health; the surface has some arabesquitic, it's difficult to slip and it looks more beautiful, also it is the reflection of happy life. UNIQUE DESIGN: Designed with detachable and free disassembly pipe, it is easier to clean the smoking pipe, to reduce the dust in the pipe after smoking; Classic shape design is very light, easy to use and convenient to carry it. 3-IN-1 PIPE SCRAPER: With the exquisite stainless steel rubbler, made of high quality of stainless steel, it can put tobacco into the bowl and prevent waste, also protect the pipe inside from damaging for dust and soot; the tamper can load and help for tobacco burning and the needle can clean pipelines and prevent clogging. So it can be said that it is multiple functional. But please be careful, because it may damage the carbon layer. SAFE AND DURABLE: This traditional form of smoking way and its structure makes it safe when using, and it can't remain some leftover; this wooden is very durable, can prlong the life span of this item. 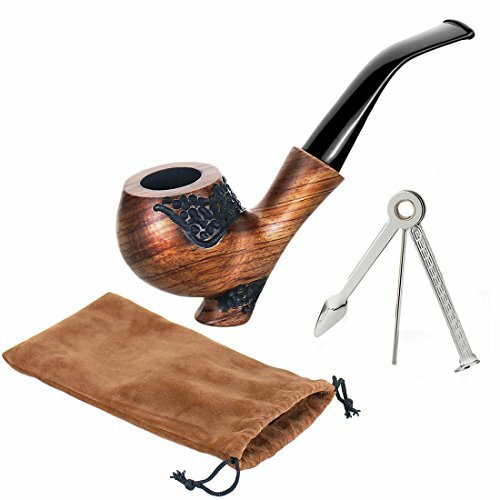 PRETTY CHOICE FOR GIFT: This package including a pipe pouch, which can hold the pipe, so it is the ideal gift on Christmas Day, Father's Day, Teachers' Day, Thanksgiving Day and Birthday etc. If you have any questions about this product by Joyoldelf, contact us by completing and submitting the form below. If you are looking for a specif part number, please include it with your message.